I'm a Level 3 Advanced Personal Trainer (attained Nov 2010), specializing in providing training to Hackney locals in the great outdoors, local parks and green spaces, using urban gym equipment, suspension trainer, kettle bells and body weight exercises. I have a particular interest in running and coaching complete beginners to run 0-5k, 5k-10k, 10k to half marathon and beyond. Being a keen runner myself is what lead me to Pilates after suffering a hip injury. Attending Sam's "Pilates for Runners" classes helped get me back to full fitness and running again. The HIP Pilates method is an ideal cross training for runners and other sports people as it moves away from the traditional Mat based Pilates, mainly being delivered from a standing position, focusing on balance, core, strength and posture. It also provides a great aerobic option for the Pilates lover looking for a more intense workout. Carole is fully insured and holds a CPR first aid certification. 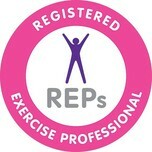 She is a member of Register of Exercise Professionals (REPS) and is bound by their respective Code of Practice. Carole is also a Body Control Pilates student teacher.